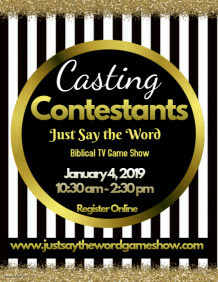 Call for Contestants for Just Say the Word Biblical Game Show weekly on Saturdays at 12 pm noon CST premiering on December 8. We are currently seeking Contestants 10 years and older to play for Prizes. This is a non pay opportunity. TV Studio located in Chicago’s South Suburb.